It’s no secret, senior year is difficult to get through. It’s full of many lasts, and facing the reality that you’ll be leaving a place that you’ve called home for four years is never easy. However, there’s another invisible weight on every senior’s shoulders that they have to carry every day that comes in the form of senioritis. 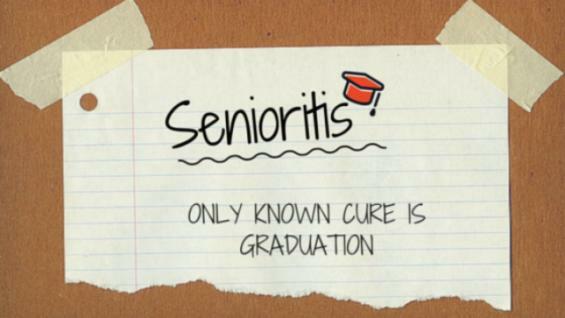 Simply put, “senioritis” is a disease that high school seniors develop shortly after the beginning of the school year. It’s characterized by an increase in the amount of times you hit snooze in the morning, a buildup of tardy slips with your name on them because of this, and the task of doing and turning in homework on time turns into an impossible feat. The students of Central Dauphin are no exception to this rule. It’s more common than you think, and some may argue that even the eleventh graders get a similar affliction in the form of “junioritis”. In this article from Gina Brennan of The Odyssey Online, she says, “The goal of ‘senioritis’ is to maintain decent grades while doing the least amount of work possible while maximizing the amount of fun, yet also avoiding the fear and anxiety brought about by the coming changes in life”. However, the school year isn’t over yet, and unfortunately for the many students that are taking AP and College In High School classes this year, the risk factor in letting your grades fall is pretty high. Getting a bad grade doesn’t just cost you a blemish on your final transcripts. You could lose scholarships, acceptances, or worse, the valuable college credit or placement you’ve been working toward all year. No matter how much motivation you think you don’t have, it’s important to finish out the year strong in order to secure your spot when we walk at graduation on June 5. While you may start wearing your sweatpants to class more and more often, that shouldn’t have an inverse correlation with the grades you receive on tests and exams. Studying now is more important than ever. Contrary to popular belief, it is possible for a college or university to rescind your acceptance once you’ve put in your deposits. Trust me, you don’t want to be that kid that boasted about going to their top school all year and then suddenly is taking an unexpected gap year because you “forgot” to read your assigned novel or write your research paper for three months straight. Nobody is saying senior year isn’t difficult, but it isn’t so hard that you suddenly drop two letter grades and don’t have any time to at least OPEN your textbook, trust me.